Traders who regularly scan options trading activity are used to seeing many of the “usual suspects” pop up on their screens—your Apples (AAPL), Amazons (AMZN), and Facebooks (FB), which will consistently trade tens of millions of shares a day, and usually have options volume to match. All three, for example, were among the top five in number of options trades yesterday. That’s what makes it interesting when a ticker symbol outside the norm enters the picture. 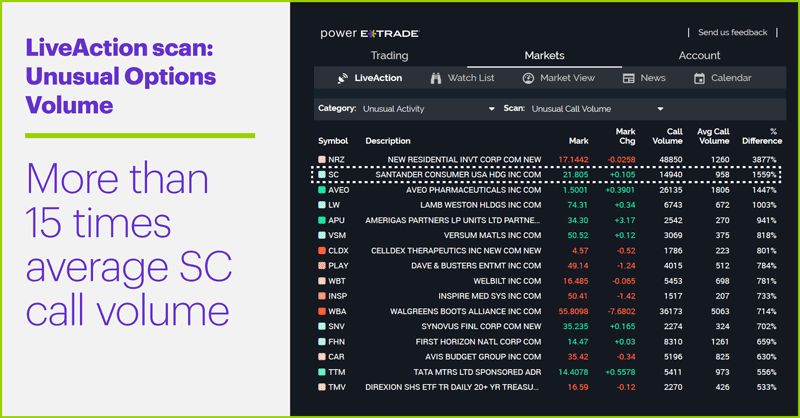 It turns out that the lion’s share of that volume (around 13,300 contracts, representing 1,330,000 shares of stock) was in the April $23 call options, which means someone may have been expecting SC to make a move in the next couple of weeks. But what kind of move, and why? An upcoming earnings release, perhaps? 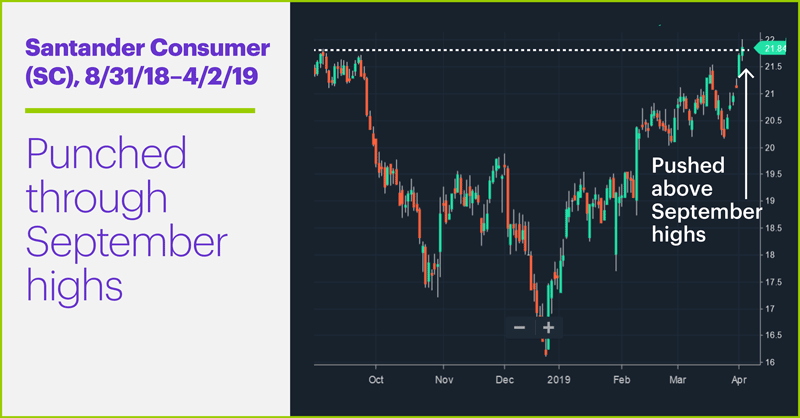 Santander, a consumer finance company, is currently scheduled to announce its numbers on April 24,1 which means the options will have expired (on April 18) before a possible earnings-driven surge could take place. So, that’s an unlikely motivation. 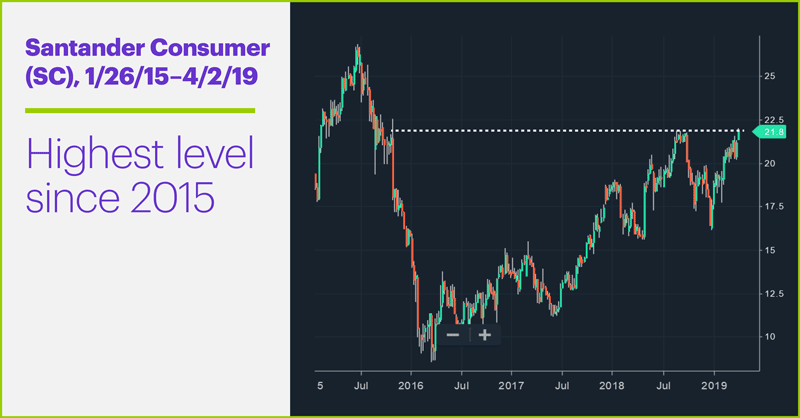 Here we see the stock broke out above its September highs on an intraday basis yesterday—one day after pushing above its late-March highs. The longer-term weekly chart below shows yesterday’s rally pushed SC to its highest level since late 2015, with the next obvious chart resistance being its June 2015 highs around $27. Can it make it there? The broad market will have a lot to say about that, regardless of how SC’s earnings pan out later this month. In the meantime, it will be interesting to see how or if the stock follows through on yesterday’s breakout in light of the options that are in play. Options traders are sometimes referred to as the “smart money”—people who know something stock traders don’t. Although that’s a myth, big trades of any kind are worth paying attention to because they suggest someone is willing to make a strong commitment on a position. The smart traders are the ones who try to synthesize all the available information in a market and plan accordingly. Market Mover Update: Airline stocks took off yesterday on the back of Delta’s (DAL) positive Q1 earnings guidance.2 DAL is scheduled to release its quarterly numbers on April 10. Cisco (CSCO) and Ubiquiti Networks (UBNT) both added to their recent upswings, with UBNT gaining more than 2% intraday. Today’s numbers (all times ET): ADP Employment Report (8:15 a.m.), PMI Services Index (9:45 a.m.), ISM Non-Manufacturing Index (10 a.m.), EIA Petroleum Status Report (10:30 a.m.). Today’s earnings include: Acuity Brands (AYI), Signet Jewelers (SIG). 1 StreetInsider.com. Santander (SC) Earnings. 4/2/19. 2 TheStreet.com. Delta Raises Earnings Guidance After Record-Setting March Performance. 4/2/18. Q1 earnings season may have traders talking more about stocks with a certain trait.